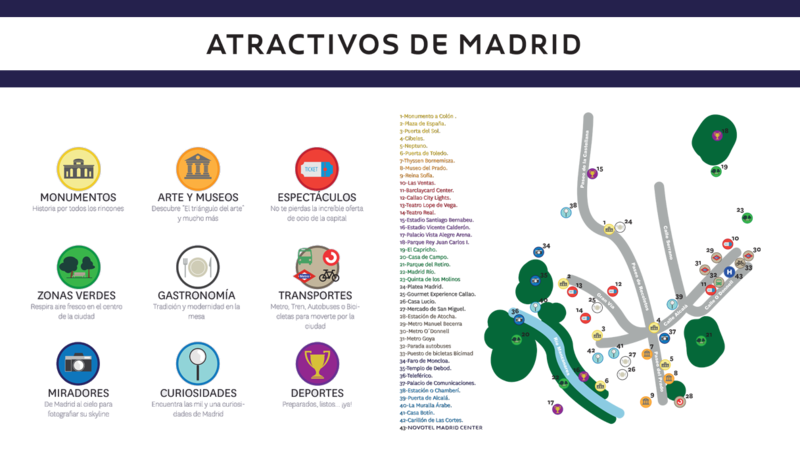 The Novotel Madrid Center can be easily reached regardless of your means of transport. From Adolfo Suarez Madrid-Barajas Airport: Take the 24h Express shuttle bus which departs from each terminal. The first stop in the city is 200mt from the hotel. By car: from the M30 motorway take exit 7A direction O’Donnell. Metro: O’Donnell (circular line 6) / Goya (lines 2 and 4).Taxi: hotel taxi stop. Airport: Adolfo Suarez Madrid Barajas. Train station: Madrid Puerta de Atocha. Metro: O´Donnell (line 6 circular) / Goya (lines 2 y 4). Taxi: Own stop at the hotel. Novotel is always with you, even when you are far away from home.